One of my favorite summer time treats zucchini bread. Especially smeared with cream cheese but now with my new dairy-free diet, coconut spread works great! Just grab a few large zucchini and a cute little helper! And lets begin. Grate the zucchini with a grater. I used an grating attachment on my kitchen aide mixer. It makes the job so much easier. Set aside. Beat eggs until well blended. Add oil, sugar, vanilla and grated zucchini to the eggs. Sift and add to egg & zucchini mixture: flour, salt, cinnamon, baking soda, baking powder, allspice, nutmeg, and cloves. Mix well until blended, scraping down sides. I used whole wheat white flour for a little whole grain. Add in raisins or nuts if desired. Divide between two greased bread pans. Bake at 350 for 1 hour or until tooth pick comes out clean when inserted. Take out and cool on wire racks. Spring is trying really hard to make itself known. But despite the chilly weather and storms we have been having, Easter is upon us. As the flowers and trees start blooming we are reminded of the new life that spring brings after the cold winter. We are promised that 'new life' also as we remember the sacrifice that was made for each and everyone of us with the celebration of Easter. Like Christmas, Easter in my family brings many traditions. Spring planting and readying for the growing season is one of them. 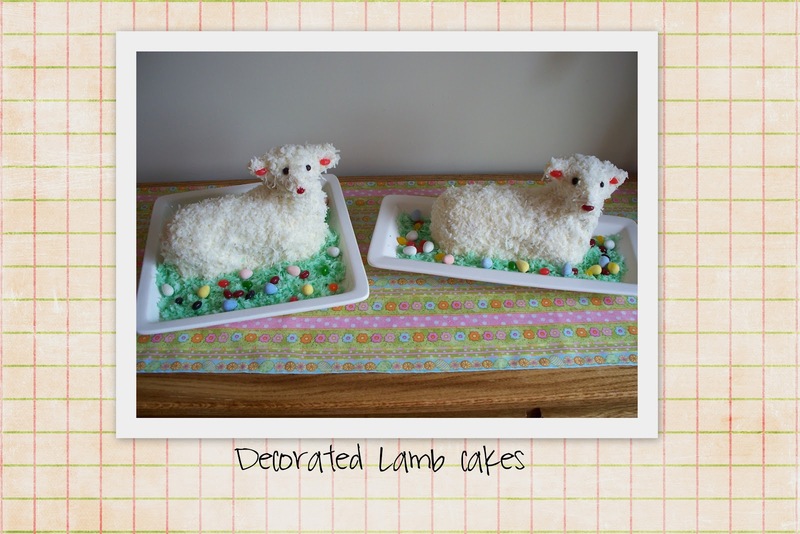 Another is the annual Easter Lamb cake that my mom made every year. 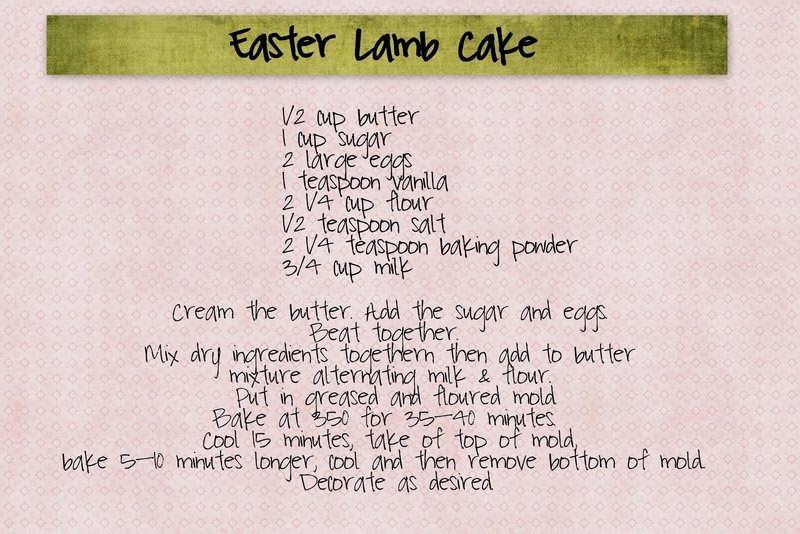 Mom usually made the lamb cakes in the early part of Holy Week and then all of us kids would 'help' decorate the lamb on Good Friday or Holy Saturday depending on how our extended family gatherings landed that year. All of us (and dad) got very excited when mom started making the cakes. We all would wait in anticipation when the lambs came out of the oven. 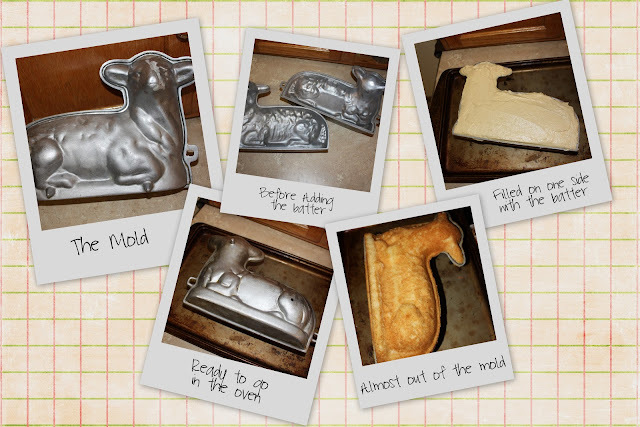 We secretly hoped that the lamb would fall apart when it came out of the mold, because that meant that we got to eat that cake! Mom would get so mad at us as we chanted...'Fall apart, fall apart,' when the mold unveiled the cake. More often than not the cake came out just fine and we had to patiently wait until Easter to eat the decadent Lamb cake. Now I am a starting my own family traditions, I get the same excited feeling as I bake our Easter Lamb cake that I did as a child. I use the same mold that my grandmother used and my mother's recipe for the cake. It's really an easy cake recipe, nothing fancy. But, the mold on the other hand sometimes has a mind of its own. The process is really a thrill in itself....waiting to see if that perfect Lamb will come out. I have had some great luck with mine, except for this years, which I had to make twice because the first one decided that it didn't want to be done but looked like it was. My second attempt turned out beautifully! We have yet to decorate it yet, but will be in the next few days. I use a cream cheese frosting and coconut to make it look like a cute little lamb. I wish you all a very blessed Easter and I hope this has inspired you to have your own special traditions. This is one of my favorites!